We are getting close to the next big update for Windows 10 and I for one am getting excited. This time it’s called the Creators Update and is expected sometime in March 2017. I participate in the Windows Insider Preview so I have gotten a sneak peek at the new update and I like what I see! I like to know what’s coming up in Windows 10 as it prepares me for the potential issues our clients might have. It makes us look good if a customer walks into our Hillsborough computer repair store with a problem in the first days of release and I already know how to fix it. Plus, I like getting ahead of the curve. So what can we expect from the Windows 10 Creators Update? 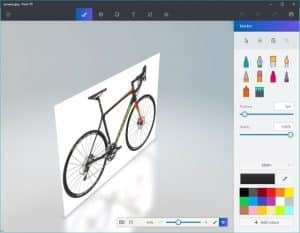 Paint 3D is a neat new feature coming with the update. It is offered in addition to Paint and offers the ability to experiment with 3D modeling. I have had a bit of a play with it and while I’m not artistic in any way, I can see its potential. If you’re the sociable type, MyPeople is going to be a welcome addition. It’s a new feature that will allow quick access to chat, Skype and social media connections. Share features will be integrated into Windows apps to allow faster collaboration or sharing of media. Microsoft will also be integrating Skype, SMS, Mail and Xbox Live with MyPeople too. While Microsoft Edge has improved massively over Internet Explorer, it still fell short of other browsers. Now that gap narrows as more features are introduced to Edge. They include tab previews, better use of HTML5, Flash blocking, the introduction of jump lists, web payments and the ability to read EPUB format within the browser. I have always been a fan of Cortana and the digital assistant gets even better with the Creators Update. It gets new voice commands and better integration so app developers can add Cortana to their own suite of options. There is also a full screen mode, better use of reminders and better integration into Windows. Installing the Creators Update showed off how Cortana now assists with Windows 10 installation, which is a neat trick. Finally, we get more control over Windows Update. The Creators Update now allows us to control how and when updates are delivered. We can delay them for up to 35 days, stop Windows downloading or interfering with drivers and set more personalized quiet hours. Better yet, the introduction of the Unified Update Platform means updates will be smaller and more streamlined too. The system makes better use of incremental updates which should make them up to 35% smaller according to Microsoft. Privacy has always been a major concern in Windows 10 and the Creators Update acknowledges that. We now have a Your Privacy page in the Settings menu that is a lot clearer about what options you have and what is done with the data. Telemetry is also tweaked, so no more having to configure Group Policy to reduce the amount of data sent to Microsoft. A small but significant improvement introduced in the Creators Update is Night Light. This allows you to tweak the warmth of your screen color to make it easier to read in the dark. This is ideal for Windows tablet users or those of us who work odd hours. It tones down the bright white and blue of LED into a configurable warmth which does make the screen much easier to use in the dark. I haven’t been able to get it working on multiple screens while leaving the app I’m working in alone yet but I’ll get there. The new Windows Defender Interface will be welcome for those of you who use it. It fits in with the Windows 10 look and makes it much easier to see what’s going on, when your computer was last scanned, what it found and offer more configuration options. The update also brings the Windows Defender Advanced Treat Protection Service, or ATP. This is an enterprise service that increases protections offered by Defender. I doubt any business relies on Defender alone to provide security, but if they do, this will help detect memory and kernel level threats. Whenever you removed a Windows Store app, it would magically reappear after an update or randomly. That should stop. Microsoft have addressed reappearing apps and should remember those you don’t want and not re-install them. I haven’t tested this yet but it will be great if it works. Windows 10 already offers a lot of personalization but the Creators Update offers even more. There is a new color picker with more color options, the opportunity to select more themes, add accent colors, select a light or dark theme and more. There is a lot you can do to make your computer your own with these changes. Many VR headsets work with Windows 10 already but it gets easier too with improvements in the Creators Update. That includes Microsoft’s own Hololens as well as VR and AR setups. Microsoft has partnered with some hardware manufacturers to give us cheaper hardware as well as better VR integration in Windows. There are a lot more improvements coming in the Windows 10 Creators Update. I have only had it about a week or so and I like what I see. Anything that makes Windows easier to use, more secure, more stable and offers more control over what goes on is good for me. All these improvements seems to make Windows 10 much easier to live with, which is always good to see! The release date of the Windows 10 Creators Update has yet to be announced but is widely expected to be sometime at the end of March or beginning of April.